Are you ready to learn about Obstructive Lung Diseases? If so, then you’re in the right place. 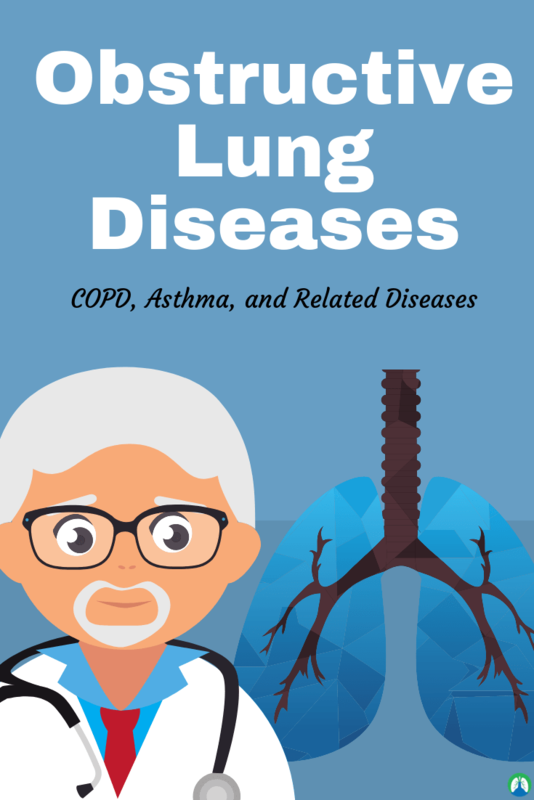 This study guide covers everything you need to know about COPD, Asthma, and Related Diseases. The practice questions found here actually correlate well with Egan’s Chapter 25, so you can use this information to help prepare for your exams. Are you ready to get started? Oh, and by the way. If your Respiratory Therapy school is like mine, then you probably use the Egan’s Workbook as well. Don’t get me wrong, it’s a really good workbook that can definitely be helpful at times. The problem is, it takes way too long to look up all the answers. 1. What does CBABE stand for? Cystic Fibrosis; Bronchiectasis; Asthma; Bronchitis (Chronic); and Emphysema. 2. What are the late signs of COPD? Barrel chest, flattened diaphragm, accessory muscle usage, edema from cor pulmonale, changes in mental status due to decreased oxygen. 3. COPD includes what two dysfunctions? 4. 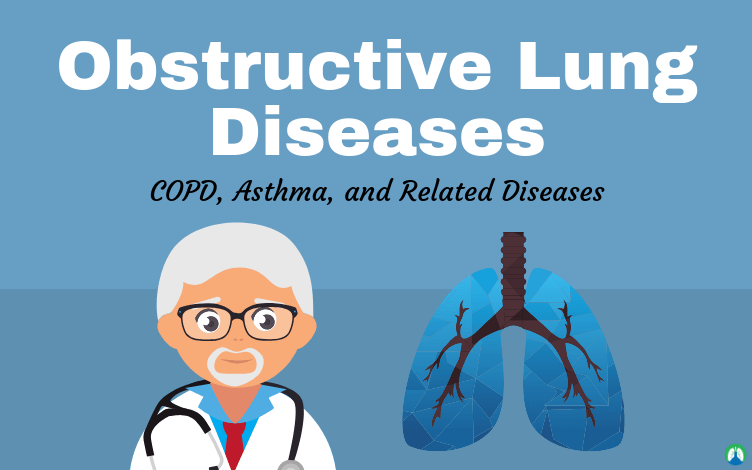 What is reduced or elevated in Obstruction Lung Diseases? The FEV1 reduced, and the VC may be reduced, while the TLC is normal or high. 5. What are the causes of obstructive airway disease? Emphysema, Chronic bronchitis, Asthma, Bronchiectasis, Bronchial neoplasms, Impacted foreign bodies, and Genetics. 6. What is Chronic Obstructive Pulmonary Disease and how may it occur? It is a group of chronic respiratory disorders that causes irreversible and progressive damage to lungs. They are debilitating conditions that may affect the individual’s ability to work and may lead to the development of cor pulmonale. Respiratory failure also may occur. 7. What is the general issue with a obstructive disease? 8. Are Obstructive Diseases reversible? They may be reversible, as with asthma, or fixed (nonreversible). 9. What do obstructive diseases result from? Results from increased resistance to air flow due to a partial or complete obstruction. 10. Obstructive diseases occur at what level? They may occur at any level, from the trachea to the respiratory bronchioles. 11. Obstructive diseases may result from what? Anatomic airway narrowing (e.g. asthma); or the loss of elastic recoil of the lungs (e.g. emphysema). 12. Chronic Obstructive Pulmonary Disease leads to what? It leads to large, permanently inflated alveolar air spaces. 13. What are the two major causes of COPD? 14. How can a COPD patient enhance survival? Smoking cessation is first-line intervention; also annual influenza and pneumococcal vaccinations help enhance survival. 15. What is the emergency management of asthma? Early and frequent use of aerosolized beta2 agonists; high dose corticosteroids; Oxygen therapy; and antibiotics. 16. What is the environmental control of asthma? Remain inside with windows closed, no pets, air purifiers, dust, and avoid all known triggers. 17. What are two characteristics of Asthma? Airway inflammation and increased mucus production. 18. What are two characteristics of Bronchiectasis? Excessive purulent sputum, and irreversible dilatation of the bronchi. 19. What are two characteristics of Chronic Bronchitis? Bronchitis for 3 months out of the year, for 2 consecutive years; excessive secretions. 20. What are two characteristics of Cystic Fibrosis? Genetic; high salt content in sweat. 21. What are two characteristics of Emphysema? Less surface area in alveoli; little to no secretions; cor pulmonale. 22. How do you optimize lung function for COPD? PRN bronchodilators for all COPD patients; Systemic corticosteroid trial; and Methylxanthines. 23. What is the primary goal of treating COPD? To maximize ability to perform daily tasks. 24. What are the two types of atelectasis? 25. What is an acute exacerbation of COPD? A state of worsening of chronic obstructive pulmonary disease (COPD). Often defined by the need to increase medication and/or escalate care. 26. What is Airway Hyperresponsiveness? State of airways that causes them to constrict abnormally in response in response to stress or insults (e.g., exercise, inhaled materials such as dust or allergens). 27. What is Airway Inflammation? Localized protective response to pathogens occurring within the routes for passage of air into and out of the lungs and invoking the release of mediators including mast cells, eosinophils, macrophage, epithelial cells, and T lymphocytes. 28. What is Airway Obstruction? A state of abnormally slowed expiration, characterized most commonly by a decrease in FEV1. It is a clinical syndrome characterized by airway obstruction, which is partially or completely reversible either spontaneously or with treatment. 30. What is a Bronchodilator? A drug that relaxes contractions of the smooth muscle walls of the bronchioles to improve ventilation to the lungs. Pharmacologic bronchodilators are prescribed to improve aeration in asthma, bronchiectasis, bronchitis, and emphysema. Abnormal contraction of the smooth muscle of the bronchi, which results into acute narrowing and obstruction. 32. What is Chronic Bronchitis? A condition in which chronic productive cough is present for at least 3 months per years for at least 2 consecutive years. 33. What is Chronic Obstructive Pulmonary Disease? Refers to a disease state of the respiratory system characterized by the presence of the presence of incompletely reversible airflow obstruction. A condition characterized by abnormal, permanent enlargement of the airspaces beyond the terminal bronchiole, accompanied by destruction of the walls of airspace without fibrosis. 35. What is Supplemental Oxygen? Oxygen delivered at concentrations exceeding 21% to increase the amount circulating within the blood. 36. Why do patients with Emphysema have a progressive difficulty with expiration? Air trapping and increased residual volume. 37. Air trapping and increased residual volume can be caused by what? Overinflation of the lungs, Fixation of ribs in an respiratory position, increased anterior-posterior diameter of thorax (barrel chest), and a Flattened diaphragm (on radiographs). 38. How can a flattened diaphragm be discovered? Radiographs, for example, as in Emphysema. 39. What is barrel chest? Fixation of ribs in an respiratory position, increased anterior-posterior diameter of thorax; commonly seen in patients with Emphysema. 40. What are the signs and symptoms of Emphysema? Dyspnea, Hyperventilation with prolonged expiratory phase, Development of barrel chest, Anorexia, Fatigue, Weight loss, and clubbed of the fingers. 41. What are the Emphysema diagnostic tests? Chest radiography and pulmonary function tests. 42. What is the treatment for Emphysema? Avoidance of respiratory irritants, Immunization against influenza and pneumonia, Pulmonary rehabilitation, Appropriate breathing techniques, and Adequate nutrition and hydration. 43. What are the warning signs of Chronic Bronchitis? Inflammation, obstruction, repeated infection, chronic coughing for 3 months or longer in 2 years. 44. What is typically the patient history with Chronic Bronchitis? History of cigarette smoking or living in urban or industrial areas. 45. What is the process of Chronic Bronchitis? Mucosa inflamed and swollen, Hypertrophy and hyperplasia of mucous glands, Fibrosis and thickening of bronchial wall, Low oxygen levels, Severe dyspnea and fatigue, and then Pulmonary hypertension and cor pulmonale. 46. What are the signs and symptoms of Chronic Bronchitis? Constant productive cough, Tachypnea, Shortness of breath, Frequent thick and purulent secretions, Cough and rhonchi more severe in the morning, Hypoxia, Cyanosis, Hypercapnia, Polycythemia, Weight loss, and Signs of cor pulmonale. Bronchial obstruction that occurs in persons with hypersensitive or hyperresponsive airways. 48. Asthma often occurs in what ages? It may occur in childhood or have an adult onset. There is often family history of allergic conditions. 49. What is extrinsic asthma? Acute episodes triggered by type I hypersensitivity reactions. 50. What is intrinsic asthma? The onset occurs during adulthood. Hyperresponsive tissue in airway initiates an attack. 51. What are the stimuli for intrinsic asthma? Respiratory infections, Stress, Exposure to cold, Inhalation of irritants, Exercise, and Drugs. 52. What are the pathophysiological changes of Asthma? In the bronchi and bronchioles there is inflammation of the mucosa with edema, bronchoconstriction caused by contraction of smooth muscle, there is increased secretions of thick mucus in the airways; and these changes create obstructed airways. 53. What are the symptoms of Asthma? Cough, marked dyspnea, tight feeling in chest, wheezing, rapid and labored breathing, and expulsion of thick or sticky mucus. 54. What are the signs of Asthma? Tachycardia, pulsus paradoxus, hypoxia, respiratory alkalosis, respiratory acidosis, severe respiratory distress, and respiratory failure. 55. What is pulsus paradoxus? When the pulse differs on inspiration and expiration, as seen in patients with asthma. 56. Hypoventilation can lead to what? 57. What is status asthmaticus? A persistent severe attack of asthma that does not respond to usual therapy. It is a medical emergency and may be fatal because of severe hypoxia and acidosis. 58. Cystic Fibrosis is caused from what? Mucus obstructs airflow in bronchioles and small bronchi. Tenacious mucus from exocrine glands. It tends to increase over time. 59. Cystic Fibrosis is seen in what main organs? 60. A patient with Cystic Fibrosis shows what in the lungs? Mucus obstructs airflow in the bronchioles and small bronchi. It causes permanent damage to the bronchial walls, and infections are commonly caused by Pseudomonas aeruginosa and Staphylococcus aureus. So there you have it. That wraps up our study guide on Obstructive Lung Diseases. I hope you can use these practice questions to prepare for your exams about COPD, Asthma and all the other related obstructive diseases. 🔒 And don’t forget — if you need access to the Egan’s Workbook Answers, we looked them up for you so that you don’t have to. Check out our Workbook Helper.